Two Cambodia National Rescue Party (CNRP) activists were reprimanded by local authorities for parading a large photograph of assassinated social and political activist Kem Ley through Kampong Cham city yesterday morning. 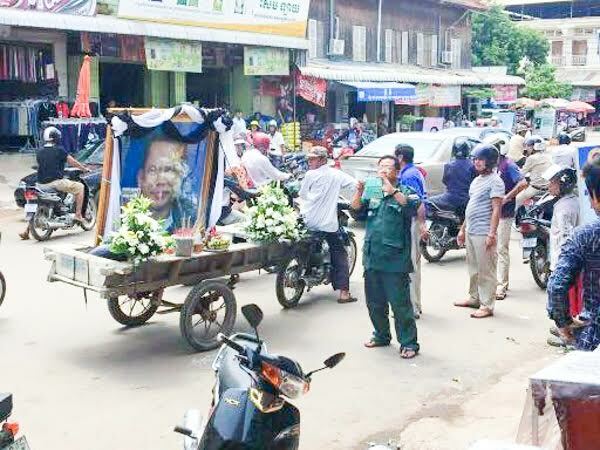 The activists, Ouch Narong and Kin Sreyoun, were stopped by police for allegedly not having received permission to drive their cart around Kampong Cham, as it was adorned with the image of Mr. Ley, a much-beloved figure of Cambodian free speech who was gunned down in broad daylight in Phnom Penh on Sunday. Police said the activists were disrupting traffic. As well as displaying the picture, the two women also made space on the cart where mourners could light incense and donate money in Mr. Ley’s memory. Both were forced to sign an agreement promising to not repeat their act of mourning by Kampong Cham authorities. 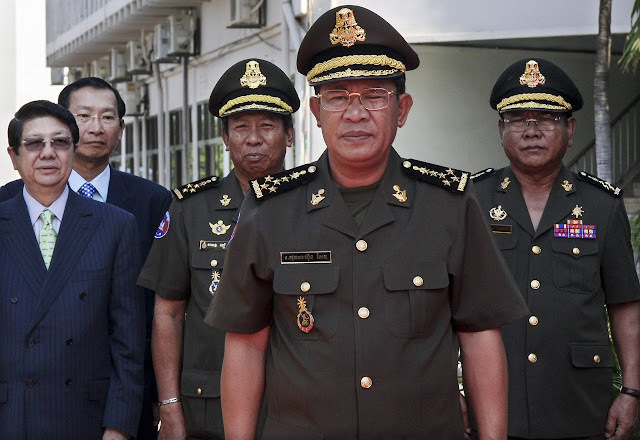 “We only stopped them and let them sign an agreement to not do that again,” Kampong Cham town deputy police chief Ros Sarath said, adding that if the women had asked permission to hold their memorial and received it from the city, they would have been protected by police. “They proceeded around with the picture across Kampong Cham into Boeung Kok market, causing chaos in the market and on public streets. What they did is against the law because they did not ask for permission to do so from the authority. “It affects the livelihoods of other citizens. If they go on their own, if there is anything that happens to them such as a traffic accident, it will cause even more problems,” Mr. Sarath added. He added that the women were not stopped from collecting money or suspected of doing so for personal gain. Mr. Sarath declined to comment on Ms. Narong and Ms. Sreyoun’s political affiliation. City police chief Soeung Chan Oun, on the other hand, was quick to identify the women as CNRP activists. “The people who paraded the picture are the activists of the CNRP,” Mr. Chan Oun said. Mean Prommony, the provincial coordinator for rights group Adhoc, said there was nothing illegal about Ms. Narong and Ms. Sreyoun’s procession, and its ban was a fundamental breach of basic human rights. “It was a complete restriction of rights. It is a breach of their basic rights,” Mr. Prommony said. “And a breach of the traditional rights of the people parading for the person they loved. “Mr. Ley was an intellectual who revealed the true story of society to the Khmer people. He had high virtue, and the people only followed their tradition in celebrating him,” Mr. Prommony added, before slamming city authorities. Kampong Cham CNRP member Mao Monyvann identified Ms. Narong and Ms. Sreyoun as party activists and said their procession in Mr. Ley’s memory was a constitutionally-protected right. “We should study more about the constitution, which states that people have the right of association or assembly. What our activists were doing had no links to politics, but it came from their pure will. They loved him. He has done a lot of good deeds in the interest of Khmer people,” Mr. Monyvann said. “If any official in the ruling party has done a lot of good and faces the same thing as Mr. Ley, we will also join together to worship him as a Khmer people,” he added.